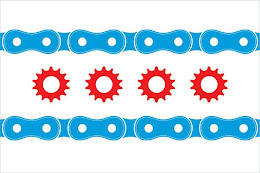 The Chicago Tribune has reported that a 53-year old cyclist has been critically injured in a hit and run incident that occurred on the Saturday afternoon of July 21, 2012. The victim was walking his bike along the 300 block of Pulaski when the motorist, a resident of the 3000 block of South Kostner, allegedly swerved his minivan into the bicyclist. The cyclist arrived at Stroger Hospital with a brain hemorrhage, fractured ribs, and bruised lungs. According to witnesses, the motorist struck the cyclist after swerving out of the way of another vehicle. No word has been released if the actions of the other motorist contributed to the collision. The motorist then doubled back and fled the scene, driving the opposite direction. Thanks to the actions of witnesses, police were able to track down and arrest the motorist. This past Sunday, he was brought before Cook County Judge Adam Bourgeois Jr, on various charges the most serious being, hit and run causing an injury and driving without a license. The judge then ordered that the motorist be held on $150,000 bond. No updates have been released on the condition of the victim. However in light of this terrible incident, it is always encouraging to see an affirmation of the goodness within people. Without the help of witnesses on the scene, the victim might not ever have a chance to see justice delivered on his behalf.